Mark Stone scored midway through the third period and Chris Tierney's second goal went into an empty net, lifting the Ottawa Senators to a 4-2 victory over the Detroit Red Wings on Friday night. Mark Stone swooped into the crease, knocked the puck in the net and pumped his right fist. Stone scored midway through the third period and Chris Tierney's second goal went into an empty net, lifting the Ottawa Senators to a 4-2 victory over the Detroit Red Wings on Friday night. 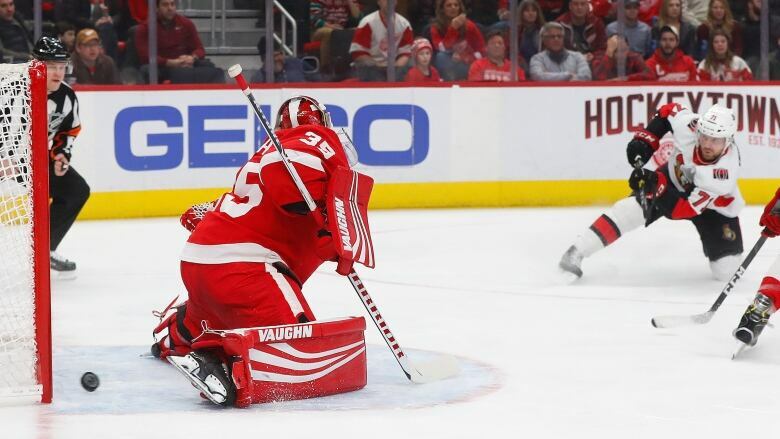 Stone had a goal overturned by video review in the first period, but there was no disputing his goal off a loose puck behind goaltender Jimmy Howard. "We have been struggling on the road," Stone said, reflecting on his rush of emotion after the score. "We're trying to get some tracking." Ottawa arrived in the Motor City with an NHL-low seven points on the road after winning just three of 14 games as visitors this season. At home, Ottawa is 10-5-3. "This was a good one because it was on the road," Senators coach Guy Boucher said. "It looked a lot like what we do at home"
Tierney and Thomas Chabot gave Ottawa a 2-0 lead in the first period. Craig Anderson finished with 23 saves for the Senators. "We had a good start, came out very aggressive offensively," Stone said. "In the third, we were very aggressive and didn't allow anything." Detroit's Luke Glendening scored late in the first period and Dylan Larkin tied it midway through the second. Howard stopped 25 shots. The Red Wings started the third period on the power play, their second opportunity with an extra skater in the game, and couldn't take advantage as usual. The Red Wings entered the game scoreless on the power play in six straight games and had scored on just 2 of 31 opportunities with an extra skater in the previous 14 games. Tierney scored on an odd-man rush 8:19 into the game after Larkin's stick broke his stick as he was attempting a shot at the other end of the rink. "Just a bad break," Detroit defenceman Niklas Kronwall said. "That's going to happen. Over the course of a full year, those even up." Chabot's one-timer from just inside the blue line got past Howard's blocker with 6:03 left in the opening period. Stone's goal in the first was overturned because a review showed the entire puck didn't cross the goal line, and he agreed with the call. "I kind of knew I didn't go in," he acknowledged. "I was just selling it." Anderson didn't see Glendening's backhander until it was too late with 1:40 left in the first, allowing the Red Wings to pull within a goal. Larkin had some good fortune after his bad break earlier in the game when he came out of the penalty box midway through the second period, setting him up for a game-tying breakaway goal on an assist from Frans Nielsen. "Real heads-up play, knew I was coming out of the box," Larkin said. Detroit hurt its chances to extend the game when Larkin was called for slashing with 2:08 left in the game, leading to it pulling Howard to add an extra skater and Tierney took advantage with an empty-net goal.